Radial insert ball bearings are ready-to-fit rolling bearings available in numerous designs that differ essentially in the outside surface of the outer ring, the method of location on the shaft and the sealing arrangement. Radial insert ball bearings with a spherical outer ring, fitted in housings with a concave bore, can compensate for static misalignment of the shaft. They can re-lubricated if necessary and are particularly easy to fit due to the various location methods. The classic areas of application for these bearings include the agricultural, construction and mining sectors, conveying equipment, textile, paper and woodworking machinery. 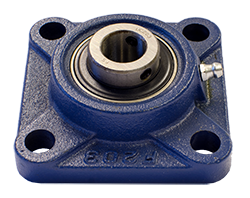 >Housing units come in cast iron, sheet steel or plastic with a concave bore in which radial insert ball bearings are mounted. They are available in either plummer block, flanged or take-up housing units in a wide range of designs for any specific application. Cast iron and plastic housings are single-piece units which can support high loads. Sheet steel housings are two-piece units and are used where the priority is not load carrying but reduced mass of the unit.